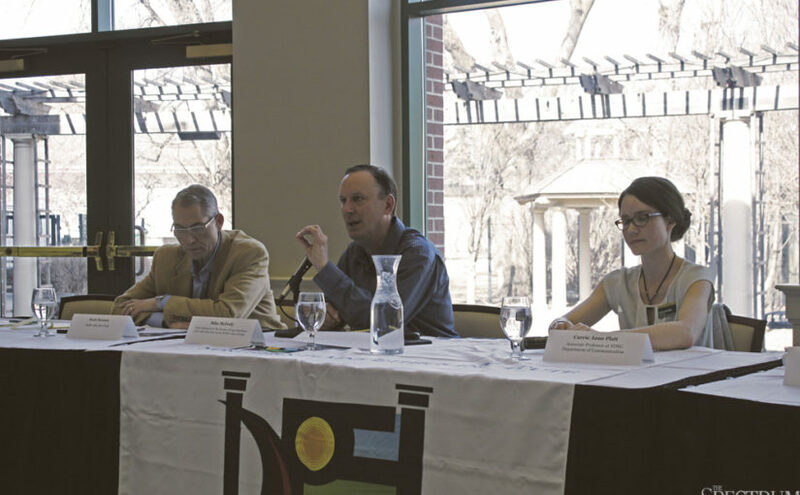 In the recent popularity of the term fake news, five professionals from the Fargo-Moorhead community comprised a panel to answer question one may have regarding the controversial issue. The panel consisted of radio talk show host Scott Hennen, news columnist for The Forum and talk show host on WDAY radio Mike McFeely, NDSU associate professor Carrie Anne Platt, former editorial page editor at The Forum Jack Zaleski and NDSU assistant professor Robert Meija. Forum Communications journalist Robin Huebner moderated the panel. “What fake news is, is a purposeful manipulation truth, of a version truth and putting it out there to make it look legitimate, to fool people,” Zaleski said. Manipulation of truth leads to the eroding of public trust. Zaleski said fake news is accelerating the erosion of trust in the media institutions that are supposed to tell us what is going on in the world. Platt defined fake news as “being the deliberate spread of misinformation,” for various reasons that are not always political, such as acquiring more ad revenue for a news outlet. This sense of solidarity can be easily attained by getting news through social media, where users can filter what kind of news they are exposed to on their timeline. “I think part of it is the consumer saying I don’t agree with you anymore so I’ll just get my news from social media,” Hennen said. “In terms of why people believe (fake news), part of it is your own existing information ecosystem,” Meija said. An information ecosystem is where consumers regularly derive their news from. In particular, social media gives consumers the option to unfollow a person or organization that holds a different opinion, thereby reinforcing their already held bias. The panel also discussed how that may just be a generational issue, not a trust issue. “I think the greatest danger is the erosion of trust in our information sources, the ones that we should be able to trust when we are investigating a topic,” Platt said. Expanding on this, Platt used the example of if someone sees a story that does not look completely true they may not know where to go to for credible information to verify facts in a suspicious story. “I think the greater danger than anything we are talking about here is the basic danger to democracy,” McFeely said. The panel agreed the most practical way of combating fake news is to become more information literate and educating the younger generation to sort credible information from falsified stories. The fake news panel was hosted by the Northern Plains Ethics Institute at the Harry D. McGovern Alumni Center at NDSU.